Archer Font Features: Hairlines | Hoefler & Co.
Because Archer’s graceful forms shine at large sizes, we’ve outfitted the font with a delicate Extra Light, a diaphanous Thin, and an impossibly fine Hairline, all included in the Archer Complete package, or available separately as Archer 2. Can you ever be too thin? All type is affected by its color and the medium in which it’s reproduced, but hairline type is especially susceptible to its environment. Of greatest consequence is a font’s size: a typeface that’s elegant in one size can become ungainly when enlarged, and can vanish completely if it’s reduced too far. 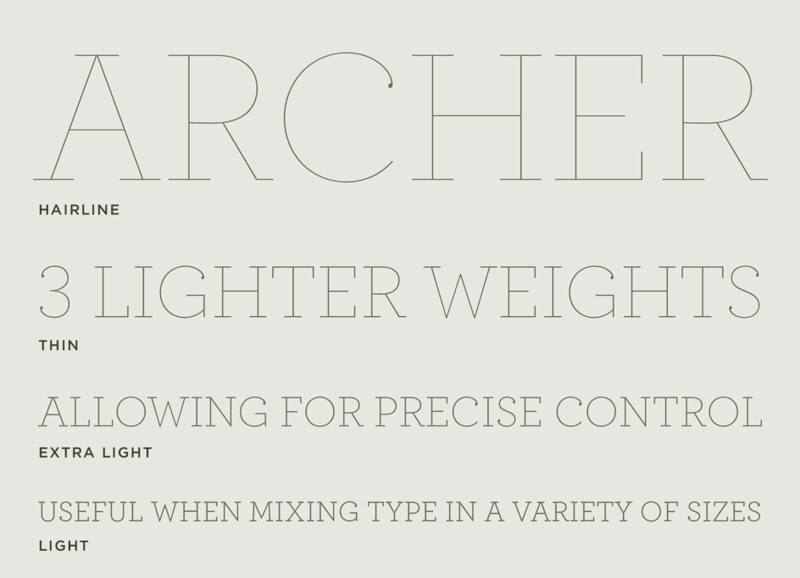 Since typography is rarely content to live at just one size, we’ve provided Archer’s lightest shades in three different weights: an Extra Light that works in small sizes, a Thin that’s useful for headlines, and a Hairline that’s ideal for anything larger. All three weights come in both roman and italic, and Pro editions of Archer additionally include small caps, tabular figures, fractions, and indices.